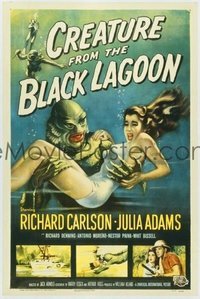 v045 CREATURE FROM THE BLACK LAGOON 1sh '54 classic! Lot #: v045 CREATURE FROM THE BLACK LAGOON 1sh '54 classic! Condition: very good to fine. There are pinholes in each corner. There is a series of extremely tiny creases and minute holes in the vertical foldline between the middle and bottom fold and very tiny paper loss at the crossfolds. There are a very few minute areas of paper loss in the blank borders. There is a 1/2" x 1" piece of scotch tape on the back of the top blank border (on each side). This tape was put there as part of the way the poster was displayed on the wall, and was not put there for any restoration purpose, nor has it bled through at all. Other than the above truly very minor defects, the poster is in really excellent condition, and other than the two pieces of tape on the back, there is no restoration of any kind. The poster was obtained from a poster exchange 40 years ago, and it was displayed in an interior room, and it shows none of the signs of fading so typical other examples of this one-sheet. The creature's lips are the original red color, as are the girl's lips, her fingernails, and the shirt of the man at lower right. The poster has a pretty "crisp" feel to it, and I can't imagine a collector who would not be thrilled to own and display this wonderful poster!